So you’ve thought about staging the inside of your home, but have you taken time to also stage the outside? It’s a question that many may not think about when they’re putting their home on the market – but potential buyers don’t want a home that just looks good on the inside, they want a home that wows inside AND out. Ensure that you’re maintaining regular mowing, edging, and weeding. You may even want to set reminders for yourself come spring, especially following winter when you didn’t need to worry too much about landscaping and lawn mowing. Spring is just around the corner so plenty of new flowers are going to be in bloom soon. While you can’t really do it until the temperatures finally stay warm, you’ll want to remove any dead plants around the outside of your house and replace them with seasonal colorful plants. Of course, as the seasons come and go, you may have to swap them out with new plants periodically. While you’re planting new flowers or plants, be sure to also add fresh mulch to all plant beds. It’s seriously amazing what some fresh mulch can do to spruce up the look of your home and add to the curb appeal! If you’re putting your home on the market, be sure to remove any lawn decor. It’s these decorations (or too many of them at least) that can really take away from the overall look of your house. You’ll also want to ensure that there isn’t any equipment left out (hoses, watering cans, etc. ), so when prospective buyers come through they aren’t distracted by sometimes unsightly equipment. Repaint the front door if it’s looking a little dull. An attractive front door can also make a lasting impression among buyers – they really love a good looking front door. 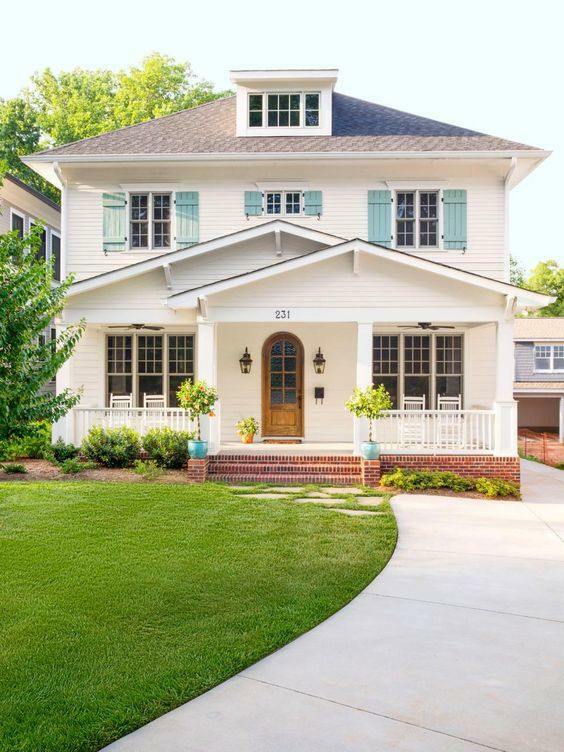 And while you’re giving the front door some love and attention, don’t forget about the front porch and entryway. You want them to be clean and inviting so that, in addition to the door, it gives potential buyers a good first impression. While you wish you could add some new siding or paint to your home’s exterior, you can really give it a quick and easy makeover with a power wash. It’s amazing what a power wash can do to take of years of dirt and grime and leave your home looking great (or even greater) again. Power washing the walkways on your property can get rid of pesky weeds that you’ve been spending way too much time and effort trying to get rid of. Lighting may not come to mind when you’re busy power washing, painting doors, and planting new flowers, but a big key to maintaining your home’s curb appeal is lights that work and are clean. You want your home to be lit up and stand out among others in the neighborhood, and if that’s what you want then it’s likely buyers may want that as well. A well-lit home also improves safety and will make a potential buyer feel like they’re moving into a home that’s secure. Prospective buyers may even give your home a nighttime drive-by just to see how it looks when the sun goes down. If you have outdoor living spaces, make sure that they’re well-kept. And if you don’t have outdoor living spaces, create some. You can easily purchase some outdoor seating, a table, or even a fire pit (depending on the regulations in your city). Spending time outside during the summer is a big thing for many people, so you don’t want to automatically turn those people away when they find out there’s no living space and they may have to splurge to create one (which may bring down the price you’re able to sell for). Creating great curb appeal for your home is just as important as staging the inside. If you need assistance getting the job done, Agricola Redesign can help!